Bouquets can look so neat and intricately put together but you would be surprised do know how easy it is to make a beautiful bouquet. Bouquets are needed for many different special occasions. Instead of spending money for each occasion, you can save a lot of money by making your own bouquets. Hand-tied posies bouquets are easy and beautiful to make. Making these bouquets can take as little as thirty minutes to do or less depending on the experience and bouquet type. These bouquets offer a beautiful, elegant, and decorative vibe to any room. Learn how to create these bouquets within five easy steps. The five steps to take when making these beautiful hand-tied posies flower bouquets goes as follows. The best part about making a bouquet is picking the flower arrangements. Long stem flowers are best for making bouquets because they are easier to hand-tie. Add a large variety of long-stemmed flowers along with some posies. Try to colour coordinate and choose flowers that compliment each other in shape, size, and colour. Once you have the selection of flowers that you are happy with, you can start making your bouquet. The first step you can start is to begin to remove any extra foliage from each flower. This is done to make sure each flower is well groomed and ready to be made into a bouquet. Making sure the leaves are trimmed off can prevent the water that the flowers will be put in from getting contaminated. Sort each flower out so that they are spread apart and ready to be made into a bouquet. Gather your string and cut out the portion that you think you may need. It is always best to cut out more string than you think you will need because more string is easier to work with than not having enough string to tie your bouquet. It is always best to start with the biggest and most attention grabbing flowers to use as the centre-pieces. Grab these attention grabbing flowers and slowly add on other flowers in a nice pattern in a circular motion. 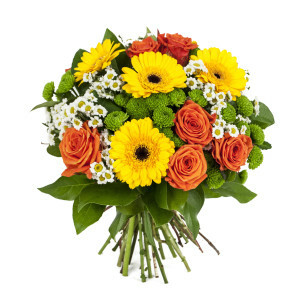 Keep adding flowers until the bouquet becomes thick and full with a wide variety of flowers. The posies should be added into the flower arrangement in bulk and spread out evenly amongst the other flowers. Make sure that the flowers are compacted tightly together. This step may be one of the easiest steps of them all. If the flowers are not tied right, it can mess up the entire bouquet. Use the string that has already been cut to tie around the stems of the flowers. Make sure to tie the stems together very tightly so that the flowers stay in place. The string should be tied around the top parts of the stem in order to place a tighter hold on the flower arrangements and keep the flowers from loosening up. This step depends on the occasion. If the bouquets are for home or events, than they need to be placed in water. Placing these bouquets into a nice vase can really make the bouquets stand out even more and can make the perfect centre-pieces for any table. If the bouquets are gifts than the stems of the bouquets can be gift wrapped. Different types of wrapping paper or even tissue paper can be used to wrap bouquets for gifting purposes.